Work and play go hand in hand, that is something we strongly believe in here at Giant Campus. 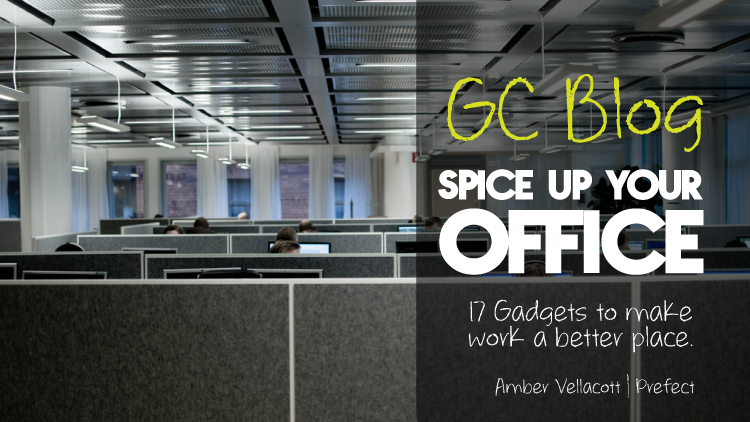 Here is a list of snazzy gadgetry you need to spice up your office. This item is calling out to the inner child and is a great way to blow off steam in the office. With colour screen and speakers, your desk will be the place to be. Now, anyone who knows us will know that we have constant office warfare here at Giant Towers. We don’t want to promote violence… but you should totally get one of these to annoy your coworkers and incite battles between you. A mini fridge to keep your lunch and drinks, safe and cool. The fridge plugs into your USB port and then sits happily on your desk. You’ll never have to leave your desk for a cool drink again! These are everywhere at the moment, and rightly so. They’re designed for the fidgeters out there to increase concentration, and therefore productivity. If you’re the first one in the office to get the fidget cube, you’ll soon be a trend setter. They’re addictive, they’re fun, they’re a must have. Create some unique 3D sculptures with this set of magnetic spheres and the magnetic base. It is a great toy to pass the time with and relieve stress. (Although, once the balls leave the base they do loose their magnetism and could roll away, so that could be stressful in itself.) Make your designs and show off your artistic prowess. We are 100% investing in one of these to show off our amazing Instagram feed. This device allows you to see your images on the 600×600 LCD screen, and even includes a button so you can continue to like the photos you see when you’re not on your phone. It also has an internal battery so you really can place it anywhere. This would look great in your office, especially if your Insta is as good as ours. When R2-D2 isn’t busy saving lives and repairing spaceships, you could find him keeping your desk crumb and dust free. This little desktop hoover is powered by USB, unfortunately not the force, but he can be trusted to do a good job. If you or a co-worker have a tendency to make a mess of the office, don’t fret! Get R2-D2’s help instead. This will also jazz up your desk so it’s a win-win. This desktop ping pong kit is transportable, so you can take it anywhere. You can play it on pretty much any surface and show your sporty side as you compete against your office. We consider this game to be a healthy distraction, you can’t stay sitting at your desk all day. Plus, depending on how competitive you are, it’s a real workout. This item is a must have for any office. Most of the time, no one can be bothered to make their own hot beverages. So, with this bell, you can bug your fellow workers by spamming it until someone makes you one! Or until they throw it out the window/at your head. On the topic of hot drinks, why not treat yourself or your office to these inexpensive blackboard mugs. This should inspire creativity in the workplace, but also ensure no one gets your tea/coffee order wrong again! Genius. This super snazzy fan has no blades, how high tech is that? It also has speakers built into it. This won’t only look cool on your desk, it will keep you cool. Ha. It’s small enough that it won’t overcrowd your desk but powerful enough to do its job. The Officiser, an active footrest, that will apparently change your life. It was created to target the issue of inactivity in the workplace, so now you have no excuse not to stay active whilst sitting at your desk. It can also help your posture and enhance your mental capacity whilst working. It’s also a great accessory for your desk if you’re a fidgeter! This retro pool table fits on top of your desk. We have a full sized pool table in our offices, but for those who don’t this is the best alternative. It’s small enough to transport about the place but big enough to play with your team. Put it on your desk, put it on the filing cabinet or even in the kitchen! Now, you might not be able to keep pets at work so you might have to settle with putting fake fish in there instead. But how cool would your desk look with this on it? How much inspiration will these little fishies be able to give you whilst keeping track of the time AND your pens? Do we need to convince you further? This particular product will prevent your tea or coffee from going cold. Simply plug it into your USB port and place your mug on top and the drink will be kept at the perfect drinking temperature. This is a clock and a fan combined. Feel cool, look cool… keep on time? Everyone will head over to your desk and have a look and instantly be jealous. It’s futuristic look will encourage you to work hard into your own future, probably? This item also features in our GC Jedi Training Box – so head on over to our giveaway to win one! Giant Towers is a constant Nerf battleground, you’ll find a Nerf Gun on everyone’s desk. It’s useful to get someone’s attention across the room, to terrorise your coworkers and, well, it’s super fun. Since they feature so heavily in our office, we thought it only appropriate to recommend they are part of yours. So, what are you waiting for? Start combining work and play. We’ll be throwing out some more info and advice on this topic soon so keep your eyes peeled. If you have any of these in your office already, or take our advice and get some of the items on the list – let us know! Oh, don’t forget to check out and enter our GC Jedi Training Box too. It’s got so many more products in than we’ve featured here. Also, don’t forget to check out the digital marketing training courses we provide here at GC. They’ll help make your business GIANT.